Hallie Lockhart, a senior marketing major from Arvada, Colorado, will study abroad in Australia this December – enjoying the country’s summer season. While there, students are immersed in unique natural wonders and exposed to different ways of thinking about agriculture and ecosystem services. 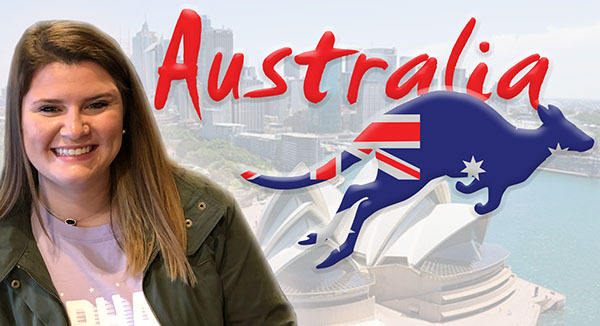 Lockhart chose the Australia global immersion program to get out of her comfort zone and see somewhere new. “I am looking forward to studying abroad with my sister and getting to experience a new place before I graduate,” said Lockhart. Our whole Nebraska group gathered for a photo in Sydney. This trip to Australia was something I will never forget. I am so glad I made the decision to travel abroad and represent the College of Business and the University of Nebraska–Lincoln as a whole. I had so much pride every time anyone asked where we were from and what we were doing. I learned so much about the Asian Pacific and I now see those countries in a completely different light. I think living in the U.S., we always see them in a competitive light, but there is so much we can learn from their innovations in technology and business practices. I also learned a lot about myself on this trip. I have always loved to travel, but this trip really revealed to me a passion I have for seeing and experiencing new cultures and places. I love navigating new areas, learning their cultural norms and spending my time finding ways to not be a typical tourist. I love to go outside the mainstream and look for ways to interact with the locals on a deeper level than just visiting the places on TripAdvisor. I really loved this country, the people and the beautiful aspects of its environment. One thing I know for sure is that I will be back to Australia in the future. Anna and Hallie Lockhart stand in front of the Sydney Opera House and Harbour Bridge. A quick three days of class and company presentations led up to our finals exam and last couple of days in Australia. While Cairns was a smaller ocean tourist town, Sydney was a larger city and a vibrant hub of technology and commerce. For our final, we evaluated some of the decision-making processes and current events relating to international business in the Asian Pacific. After our final was over, we did the best thing we could think of: head to the beach. When you think of the perfect beach, you see a semicircle of bright colorful houses lining a soft sand beach that leads into crystal clear, bright blue warm water. When we came over the hill and Bondi Beach, we saw just that. We navigated our way past other dozing, sunburned beachgoers and spread our towels out in the soft sand. Sunscreen on us, we walked down the crowded beach, between the two flags into the clear water. And it was so cold! We didn't go past our knees because the cold waves were nothing like we expected. Some of us thought the water was very refreshing in the hot summer sun, but others went back to lie down and warm up again. We decided to do something to celebrate one of our final nights on the trip. A couple people went off to climb the Sydney Harbour Bridge, but a majority of us rode the elevator up the tallest building in Sydney to the rotating restaurant at the top. We sat at the window and looked out at a 360-degree view of Sydney. The restaurant was a buffet, and let me tell you, a rotating buffet is confusing. Every time we would get up to get another round of appetizers, or someone at the table convinced us all to try the kangaroo, we had to walk a full circle to figure out where the food we wanted to eat had gone. The first time I got up I was standing near the dessert, the second time I was back at the salad. Finally, a few of us took a quick Uber ride to walk over the Harbour Bridge to see the skyline at sunset. Besides the shaking of the bridge from the cars, causing us to fear dropping our phones into the harbor, it was the perfect ending to a perfect trip. Anna and Hallie pose with a Koala at Hartley’s Crocodile Adventures. At Hartley’s Crocodile Adventures, we watched our tour guide drive the boat through the river to a crocodile sleeping in the murky brown water. The driver pulled half a chicken out of a cooler and tied it to a long pipe. He dangled it over the side of the boat and lured the crocodile into a jumping frenzy. The crocodile sprang up, out of the water and after a few attempts finally captured the chicken. The driver did this a couple more times on our way around the river all the while explaining the other wildlife in the area and how they have rehabilitated many of the animals in their care. After watching many feedings, we decided to head to a more cozy part of Hartley’s. We went to see and hold koalas, and I 100 percent recommend holding a koala if you get the chance. All the trainers walk around with koalas hanging on their shoulders and just go with it. After Hartley’s, we went to the rest of the wildlife park that houses all native Australian animals. A big group of us went into the “Living Art” area of the park. It’s actually spiders and snakes, which I think they don’t tell you intentionally. While we were walking through, we looked at one of the iPad screens with information about the snake in that enclosure, and there was a HUGE spider. No exaggeration at all: The spider was half the size of the iPad. Of course, the girls all screamed and left, and we all had the creepies for the rest of the day. Following our exciting day at the rainforest, we had a full day of classes. I have had many funny professors, but our instructor Nigel told the best dad jokes I have ever heard. He really set us up to be interested in what he was teaching about. After every answered question, he would give us a new type of Australian candy to try as well. Although classes were fun, we were all excited to head to the lagoon to watch the fireworks and be some of the first people in the world to celebrate the New Year. Hallie and her sister, Anna, scuba dive at the Great Barrier Reef off the coast of Cairns. How fitting we Huskers went to the GBR, the local shorthand for the Great Barrier Reef. However, once we got on the boat, it was every person for themselves! We were traveling an hour and a half off the coast in 30-knot winds. They described it as “going to be a roller coaster ride,” and it was all that and more. We decided to take the ginger tablets and pharmaceutical-grade sea sickness pills, and were very grateful that we did. The swells out to the Great Barrier Reef were close to 10 feet. Once we were moored at flint reef, the waves calmed down a bit to around three feet high. We snorkeled during our first round in the water. We didn’t take in too much salt water, but with the large waves and strong currents, we tired quickly and got back into the boat. Our second trip into the water we decided to go below the breaking waves and scuba dive. After going over the basics, we hopped into the water fins first. We linked arms and made our way around the reefs from a lower angle. This dive went very fast and we were soon crawling back onto the boat. Our crew made us a beautiful lunch that was perfect after about an hour in the water. My third time in the water started a little rough. We had moved to a new spot on the reef, and the waves were about five feet high now. They were beating on the side of the boat. They had us jump off the high deck for this dive, which was about six feet above the waves. When I jumped in, even though I was holding my goggles and breathing regulator, my goggles filled with salt water and I lost my regulator from my mouth. After a little struggling, I got my regulator back in my mouth and purged the water. I blew the salt water out of my goggles and grabbed the rope that was holding the boat in place. My eyes were stinging from salt water, I was trying to keep a hold of the rope and steady my breathing while we were slammed up and down by the waves. We soon deflated our vests and sunk below the waves to the calm ocean floor. We got to swim unassisted around the reefs. We saw some huge teal parrot fish, Christmas tree worms and a stingray. After a crazy boat ride out, there is nothing quite like standing on the ocean floor looking at the Great Barrier Reef with only the sound of my regulator and the waves crashing above. Hallie Lockhart and three other Huskers after running though the rain. We hopped off the plane at LAX with a two-mile walk to the international terminal ahead of us. We walked through long hallways below the airport to finally come up the escalators into the huge, brand-new international terminal. Soon after, a bunch of familiar red-clad students joined us at our gate. About eight of us in total were making the 14-hour flight to Brisbane together. Our mom bought us this magical jet lag medicine suggested to her by the lady at the travel store, but in order for it to work, we had to take it every four hours. We set alarms on our Apple watches to wake up and take it. Each time, it would wake both of us up, right when we finally got into a good sleep. I do think it helped a lot though! Along with that, we had three meals in our two flights on the Australian airline, and every one of them had spinach as an ingredient. It was some of the best airplane food I have had though. So far, I’ve noticed a couple thingsculturally-speaking, but one of them is that I thought Nebraska people were nice, until I met the Australians! So far, every person who has helped us has gone above and beyond what I expected. They are very welcoming and have been very helpful, even as we ran through the Brisbane airport to make our connecting flight to Cairns. Even the airport security people were nice. On our walk from a lecture about the Great Barrier Reef (GBR they call it, very fitting) to dinner, we encountered a torrential downpour. None of us had any rain gear. All our shoes were slipping off, and we were trying not to arrive soaked to the restaurant. This was a complete failure and we shivered our way through plates and plates of pizza. Even though day one covered December 26-28 and lasted 35 hours, it was a great one. Anna and Hallie Lockhart are packed and ready to go. 48.7 pounds: That’s what a suitcase packed for winter and summer weighs. I am the queen of overpacking, so I had to work really hard not to for this trip. To be honest, I did have to take my winter boots out and put them in my backpack to make it under 50 pounds! After a long week of finals, my sister, Anna, and I headed to the Omaha airport to catch our 6 a.m. flight home to Denver. We packed all our long sleeves and mittens for the two weeks we get to spend at home in Colorado before our trip to Australia. We will leave from Denver on December 26 to make the long, but exciting trek to Australia, where the temperature outside will be in the 90s. The other half of our suitcases are full of fun patterns and shorts. We decided to leave our winter clothes in Colorado to keep our suitcases light for souvenirs. Let me tell you firsthand: Packing cubes are a life saver. If you are going anywhere for longer than a day, you need packing cubes. If you don’t know, they are basically little bags to separate all your clothes from each other. I have one for my T-shirts, one for my jeans, etc. They helped us keep our warm and cold clothes separate, and then we can easily take out what we need to leave at home. It’s been nice to have my sister to help with packing, so we can double check we didn’t forget anything. Honestly, I cannot wait to travel with my sister. She will turn 20 while we are there, so we will get to celebrate her birthday and watch New Year’s fireworks on the beach. We are already planning a trip to a bakery from our favorite baking show. It will also be nice to have someone to sit next to on our 13-hour flight from Los Angeles. When we get to L.A., there will be a couple other people from Nebraska meeting us there. We are ready for this trip, and the awesome friendships that will come from it! I had pretty much decided I wasn’t going to study abroad during my years at Nebraska. I was too nervous to be all the way across the ocean from my family. I was always taking classes during the summer, and there was no way I was missing the football or basketball seasons. As I neared the end of my junior year, I was running out of time. I heard some students in class talking about the short trips the College of Business hosts every year. I realized this was something I could fit into my final year of school. Australia was perfect. It’s the final two weeks of winter break, when Nebraska and Colorado winters are just getting started. Why would anyone not want to lie on a beach or scuba dive around the Great Barrier Reef? I had no reason not to apply. Now I am sitting here with my passports updated, my flights purchased, and we started our class projects to prepare for our time in Australia. In class currently, we are creating business ideas that would create jobs for 10,000 employees worldwide. My group conceptualized a footwear company that uses recycled ocean plastic to create versatile shoe soles. By doing this, we can collaborate with large established footwear companies to do an exclusive run of their products on our shoe sole. On top of creating a company, doing the market research and analysis, and creating a marketing plan for them, we will immerse ourselves in readings about other cultures and how they do business. “The Culture Map” book will help us look at the cultural norms in Australia and see how they affect their business relationships and dynamics with other cultures. We then get to see firsthand how this plays out while we are on the trip. I can’t believe we are only month and a half away from a trip that I never thought I would go on, and I know will be one of the greatest experiences of my life.